Welcome to the Highland Scrutineer web site! 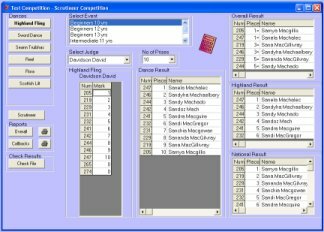 Highland Scrutineer is a professional software application written to aid the administration and running of Highland dancing competitions worldwide. This current version is a recent re-development of the system successfully currently in use by several of the major Championships including Cowal Highland Gathering, for entry management and scrutineering of the Scottish and World Championships. Highland Scrutineer is ideal for any type of competition from large National championship events to smaller local competitions. Online and email support is included in your purchase. Highland Scrutineer is developed and maintained by Deryck Mitchelson, an Honours graduate in Computers Science and expert in scrutineering methodlogies. Rapid entry of competitors. A searchable, excel style ,data entry grid allows for easy data entry and assignment into relevant classes. Highland Scrutineer can also be used as a stand-alone entry management system. Flexible Dance Classes (Groups). Highland Scrutineer allows you to configure multiple classes (groups) each of which can have their own dance selections. Automatic Championship Tie-Breaking. Highland Scrutineer has been developed to automatically break championship ties, right down to six places. No more searching for your rule book and number crunching! Flexibility in number of prizes. Highland Scrutineer allows you to set the number of prizes to be be given in each class (group) and scrutineers down to that level. Customisable scrutineering of competitions. Highland Scrutineer allows you to break down an age group into Overall, Highland and National winners. Stewarding Sheets. Highland Scrutineer provides a facility for easy printing of stewarding sheets. Mult-format Reports, Reports can be viewed, printed, saved as HTML for upload to your website or exported to Excel. Don't compromise on functionality - Get your copy of Highland Scrutineer only £60! New release - v2.6.6 now available! We are so confident that you will love Highland Scrutineer that you can now download and use the software FREE OF CHARGE until 2007.
rent if for an annual charge of £15. "We use 'Highland Scrutineer' for both entry management and scrutineering for our smaller monthly competitions and championships and are delighted with both the ease of use and powerful scrutineering functions!!" "No more reaching for the calculator and rule book to split championship ties - 'Highland Scrutineer' does it all at a click of a button." "I run many small competitions where the numbers in each class are relatively small resulting in variation in number of prizes awarded. 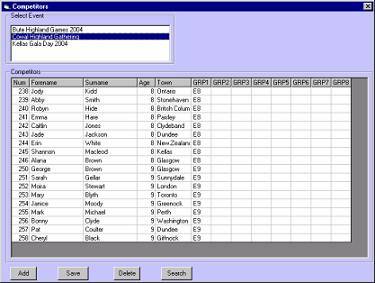 'Highland Scrutineer' lets you set the number of prizes in each age group and then scrutineers respectively.